Obama took a two-day swing through the critical battleground state of Florida. MIAMI, Florida (CNN) – Barack Obama told a Miami rally John McCain is “running out of time” and as a result has taken to “making stuff up” on Obama’s record and tax cut plan. “He’s decided to make up, just fabricate this notion that I’ve been attacking Joe the plumber. Now, let me tell you something even just yesterday, Joe the plumber himself said that wasn’t true. I’ve got nothing but love for Joe the plumber. 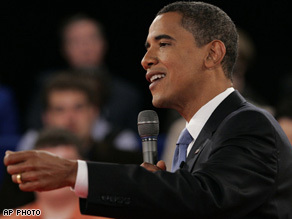 That’s why I want to give him a tax cut,” Obama said. On Tuesday, Obama wrapped up a two-day Florida swing designed to pump up supporters and get them to vote early. Obama dropped by a Ft. Lauderdale campaign office and told volunteers Florida was key to a general election victory. The Democratic nominee also visited an African-American barbershop next door, and implored the owner and patrons to drive out the vote. “You know everybody can early vote, right? Right down the street, so I want to make sure anybody that comes in and sits in that chair you got to tell ‘em go early vote. No excuses,” he said. In a nod to large Jewish population in South Florida, the candidate visited the “Deli Den” and ordered a plethora of traditional food including whitefish salad, nova, bagels and the requisite dessert. “I was saying there’s a great Jewish tradition, an oatmeal raisin cookie, you guys want any sweets?” Obama said jokingly to Representatives Debbie Wasserman-Schultz and Robert Wexler, who offered up the idea of the black and white cookie. “One black and white cookie, “ Obama said. “Two black and white cookies. It’s a unity cookie,” Obama said.